"Alexa, disable the auxiliary laser beam." On the one hand, you want to turn your house into an intruder-proof Fort Knox. On the other, you don't want to lift a finger to get your home in lockdown mode. Once again, it's Amazon's Alexa voice assistant to the rescue, with new security features to further automate your castle. 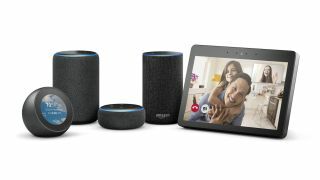 If you have an Echo speaker or another Alexa-enabled gadget in your possession, you can now train selected smart home security systems to be activated by your voice. We're not talking a single Ring doorbell here or outdoor camera there – we're talking the full 'call the SWAT team if a gentle breeze rattles my window' type security systems, the kind that can have a professional installation to cover every part of your home. Rolling out in the US first, companies like Abode, Honeywell, Ring, ADT and Scout alarm have already signed on to allow the new Alexa Security Panel Controller framework to interface with their systems, letting users control security features with their voices. Users will be able to enable or disable alarms, trigger different security settings for when they are indoors, away or sleeping, and check in to make sure nothing untoward is happening. Amazon is aware that some people may feel that voice control over these elements may be undermining the integrity of the systems. After all, shouting your pin out every time you want to lock up doesn't seem wise. But it's an opt-in option to manually enable disarming systems by voice, and Amazon is implementing a voice pattern recognition code to verify only the right people gain access to your home. Whether or not you feel that's good enough to defend against a talented impressionist is up to you. The best smart speakers: which one should you buy?